"I've never seen anything like this," says one trucking company CEO. 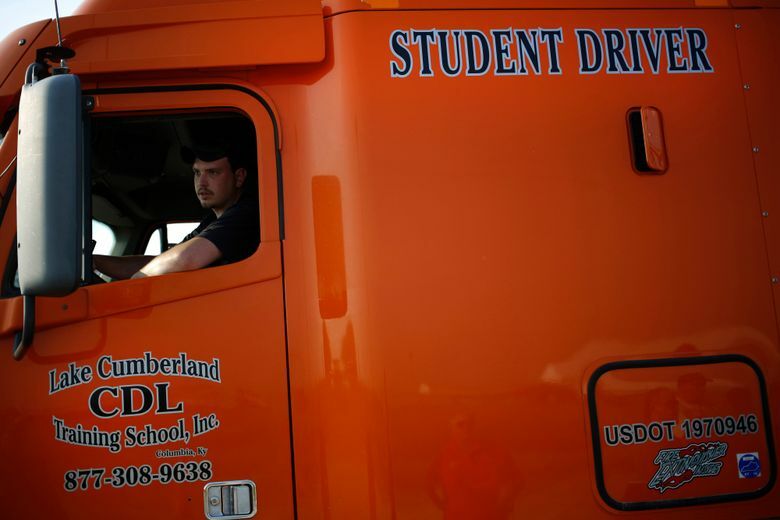 Truck drivers are getting 15 percent pay raises. A year ago, when customers would call Brenny, she could almost always get their goods loaded on a truck and moving within a day or two. Now she’s warning customers it could take two weeks to find an available truck and driver. Trucking executives say their industry is experiencing a perfect storm: The economic upswing is creating heavy demand for trucks, but it’s hard to find drivers with unemployment so low. Young Americans are ignoring the job openings because they fear self-driving trucks will soon dominate the industry. Waymo, the driverless car company owned by Alphabet, just launched a self-driving truck pilot program in Atlanta, although trucking industry veterans argue it will be a long time before drivers go away entirely. Brenny anticipates she will have to raise pay another 10 percent before the end of the year to ensure that other companies don’t steal her drivers. “The drivers deserve the wages. They really do, but the raises are coming so fast that it’s hard to handle,” said Brenny, who is having to adjust contracts for drivers – and customers – rapidly. The United States has had a truck driver shortage for years, but experts say it’s hitting a crisis level this year. There’s even more demand for truckers now as just about every sector of the economy is expanding and online sales continue to soar. On top of that, the federal government imposed a new rule in December that requires drivers to be on the road for no more than 11 hours at a time. Drivers are now tracked by an electronic device that monitors their time so they can’t cheat. America had a shortage of 51,000 truck drivers at the end of last year, Costello found, up from a shortage of 36,000 in 2016. He says “without a doubt” it’s going to be even higher this year, even though many companies are giving double-digit raises. He gets asked about the driver scarcity daily as companies try to figure out how to handle the growing backlog. His best advice is for companies to invest in technology like what Uber and Lyft have to cut down on the time a driver or truck sits idle between runs. As driver pay rises quickly and diesel fuel costs tick up, shipping companies are charging higher and higher rates to move goods. It now costs more than $1.85 a mile to ship a “dry good” that doesn’t require refrigeration or special accommodation, a nearly 40 percent increase from the price a year ago, according to data from DAT Solutions. Manufacturers are complaining that higher shipping costs are causing their profits to fall. It was a constant topic of discussion as American firms reported earnings in recent weeks. Walmart said this week that high transportation costs are its “primary head wind” right now. “Every single good ends up on a truck at some point. Businesses that use trucking to receive and ship goods are going to do their best to pass on the costs to the rest of us,” said Peter Boockvar, chief investment officer at Bleakley Advisory Group. There already aren’t enough trucks on the road to keep up with demand this spring. It could get even worse when the holiday season hits. Trucking companies hope they can lure more drivers with higher pay, signing bonuses and shorter hours. The job doesn’t require a high school degree or being in great shape. Someone can obtain a truck license in a matter of weeks, although they must pass a drug test. But many say the biggest hindrance is that the job doesn’t have a lot of cachet in modern society, a perception that’s hard to change. “You are away from home and family and friends on a regular basis, and the job is not highly respected,” Broughton said.